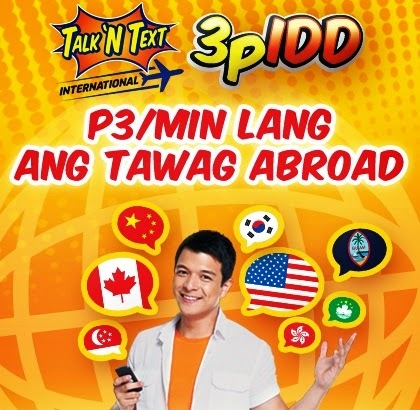 Another promo has been released by Talk N Text, this time to cater the needs of communication to international level. Though there are vast ways to communicate to your love ones abroad (like Skype, Facebook) nothing can been an IDD (International Direct Dialing) services, why? You don't need internet just load, it is so convenient since you can call abroad even on remote areas in the Philippines. To call dial *3003<00><Country Code><Number> then hit dial. You don't need any promo codes to avail the cheapest international call promo. For further reference please see the picture below. This promo is only available on the countries provided above ( Canada, United States of America, Hong Kong, Singapore, China, South Korea, Guam, Macau). This promo is only available to Talk N Text subscribers. IDD means international direct dialing which means you don't need to register to any promo just follow the dialing format above.